CTMountaineer claims: “Taxpayers are not ‘giving’ WVU a ballpark.” The claim is False. In fact, $16.2 million in local taxpayer TIF district funds will be used to build the ballpark. And the Monongalia County Commission has publicly indicated its willingness to sign away, prior to construction, all ballpark operation and management to WVU as well as eventual full ownership of the ballpark. CTMountaineer claims: “The only funding involved with this project will be created right there on site from usage.” The claim is False. Local tax increases for up to the next three decades – including such predictable tax revenue increases from, for example, the existing Sheetz and McDonalds and Target and WalMart, etc, in the TIF district and from everywhere else in the TIF district – will be used to pay off the $16.2 million construction of the ballpark. For the next 30 years all the anticipated and predictable property and sales tax increases that would have gone to the county and state will instead go toward paying off the ballpark and paying for tens of million of dollars of infrastructure payments on roadways and other upgrades serving the ballpark and the privately owned businesses and commercial enterprises currently existing and anticipated. CTMountaineer claims: “The county will receive the same amount of property tax on the adjacent land they have in the past. The only difference is the improvements (which are not now in place) won’t be subject to property tax until they are paid for.” The claim is False. Mon-View LLC developers expect the current development plans for the TIF district to be paid for within about 10 or 15 years, but all county property taxes and state sales taxes on such development will remain locked into the TIF district (and away from the rest of the country) for up to 30 years. Moreover, benchmarking property tax for all the properties in the TIF district at the current level for general county use means that in real dollar terms, due to inflation, the county loses money every year for the next thirty years, in addition to not being allowed to spend a dime of 3 decades worth of property and sales tax increases outside of this thriving largely commercial district, and apparently not being allowed to spend the money even inside the district on anything but infrastructure support for the private developments and business operations. CTMountaineer claims: “The county is out nothing, and 30 years down the road they get the benefit of the improvements for tax purposes. In the meantime, the people of the county get all the considerable benefits of the improvements for nothing.” These something for “nothing” claims are False. For 30 years, the TIF district legislation locks in these massive local taxpayer funds to this thriving largely commercial and uninhabited TIF district area, and away from all the rest of the county – that’s what the “county is out” – including away from many populous and impoverished areas that are starved for badly needed public services and infrastructure. $16.2 million of these public funds will be used to build the baseball ballpark that County Commissioners indicate WVU will manage, operate, and then own for the taking. $16.2 million-plus is not “nothing” – very far from the county getting something for nothing. 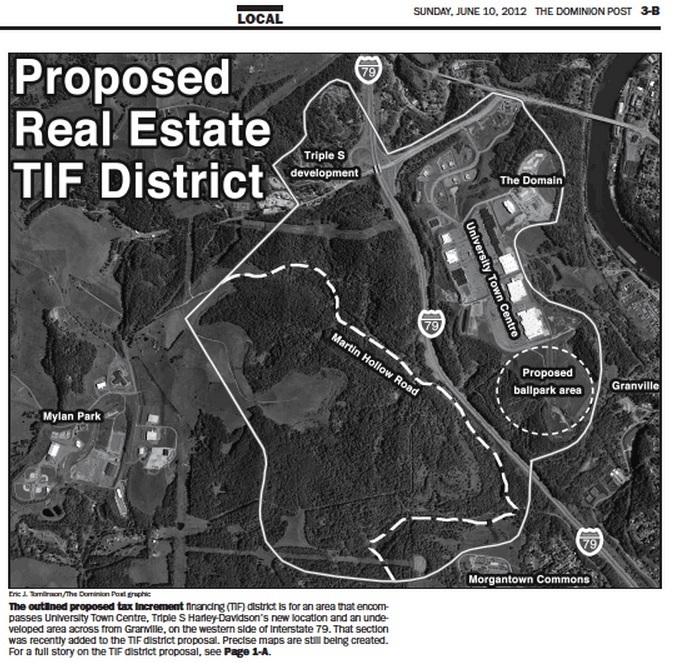 Rather, WVU is getting something for nothing, or virtually nothing – and so are the TIF district businesses, when one considers the $28 million TIF highway interstate interchange, to be built entirely with local taxpayer funds, which TIF district commerce will benefit by. $28 million is not nothing either, let alone the additional tens of millions of dollars that the TIF legislation locks into that commercial and uninhabited district. The general county loses 30 years worth of taxes on “improvements” (that is, property tax increases) much of which would occur without or without the TIF legislation. CTMountaineer claims, and this is the basic, biggest lie: “Mon County, and the state for that matter, will see this entire project take place without having to part with any significant amount of money at all from their budgets.” The claim is false. This claim pretends that the future – somehow, magically – does not exist, that predictable revenue increases do not exist, that expected inflation and growth are figments of the imagination. Try this analogy: A husband returns home after work one day pulling a boat on a trailer worth tens of thousands of dollars. Meanwhile his car and house and land are falling apart and in disrepair. “You’re either crazy, drunk, a liar, or all three,” the wife says, as another shingle falls off the house roof, the bumper falls off the car, and part of the yard collapses into a ravine. At which point the wife strikes down the lunatic with a frying pan. Or, in the case of the TIF, the boat boys pat one another on the back and say what a wonderful thing they are doing for the families of the area. That’s the big lie. That’s the “ballpark TIF” plan.